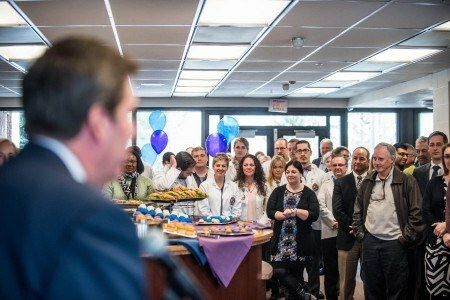 SPOKANE, Wash. – The University of Washington School of Medicine and Gonzaga University today celebrated the first anniversary of the Regional Health Partnership, an initiative to advance medical education and research in the Spokane region. In February 2016, the two universities signed an agreement to work together to find solutions to the most pressing issues in healthcare in the state and eastern Washington, including the rural physician shortage. By uniting Gonzaga’s commitment to educational excellence, leadership and service, with the UW’s nationally recognized medical school and research engine, the partnership enables the continuation of a long tradition of educating doctors in Spokane and eastern Washington. It has been a busy and productive year for the partnership; many success milestones were reached, including remodeling GU’s Schoenberg Center as the new Spokane home of the UW School of Medicine. In June 2016 faculty and staff moved into the renovated space, and in July, the partnership’s first director, Courtney Law, was hired to advance health-related research, entrepreneurship and inter-professional health education, as well as oversee the collaborative effort to create new academic facilities to support the partnership’s priorities. In late August, 60 medical students – the largest-ever class of first-year medical students in Spokane – arrived at GU for Clinical Immersion and Orientation, two weeks of intensive training to prepare them for medical school. They joined 40 second-year students for classes that began in early September. An important element of the Regional Health Partnership agreement was to establish a Spokane Advisory Board to work with the community to identify opportunities, and engage in collaborative solutions to improve eastern Washington’s economy. The Advisory Board was appointed by the presidents of Gonzaga and the UW, and includes business, civic and healthcare leaders from the greater Spokane area. Mike Wilson, retired CEO of Providence Sacred Heart Medical Center and Children’s Hospital, chairs the board. Thus far in 2017 the partnership has welcomed the expansion of UW’s CoMotion Labs to Spokane to connect the region’s vibrant startup community more fully with western Washington’s. CoMotion Labs contributes to the growth of the innovation community in eastern Washington by bringing UW resources, assets, tools and networks to the region. Also this year, Darryl K. Potyk, M.D., was named chief of medical education for the partnership, and UWSOM associate dean for eastern Washington. This is the first appointment of an associate dean outside of Seattle. In his new role, Dr. Potyk will lead the medical school’s operations and expansion in Spokane and eastern Washington, overseeing all four years of the UW School of Medicine’s medical education program. He continues to work with William G. Sayres, M.D., who serves as Assistant Dean, Foundations Phase, and John McCarthy, M.D., Assistant Dean for Rural Programs. What’s Next? UWSOM has made a legislative request to the state to fund an additional 20 medical students, increasing the entering class size from 60 to 80 students. Additionally, plans are beginning to take shape around a new facility on the GU campus to house teaching and research programs. February 2016: The UW School of Medicine (UWSOM) and Gonzaga University (GU) form a Regional Health Partnership to enhance and expand medical education in Spokane and eastern Washington. March-June 2016: The Schoenberg Center on the GU campus was renovated to accommodate 60 first-year medical students, 40 second-year medical students, faculty and staff. June 2016: Faculty and staff move in to the Schoenberg and start preparing for the entering 2016-17 class. July 2016: The Regional Health Partnership’s first director, Courtney Law, was hired to oversee the collaborative efforts of the partnership. August 2016: 60 first-year students arrive on campus for Clinical Immersion & Orientation – courses that prepare them for medical school. September 2016: Medical students begin classes in the Schoenberg Center. December 2016: An 11-member Community Advisory Board was appointed by GU President Thayne McCulloh and UW President Ana Mari Cauce to identify opportunities and engage in collaborative solutions to improve eastern Washington’s economy. January 2017: UW CoMotion Labs expands to Spokane to connect startup efforts on the east and west sides of Washington state. February 2017: Darryl K. Potyk, MD, was appointed Chief of Medical Education for the UW-GU Regional Health Partnership. In 2016 the University of Washington and Gonzaga University formed a regional health partnership to continue, enhance and expand medical education and research in Spokane. The agreement makes Gonzaga a partner in the University of Washington’s regional, community-based medical education program, WWAMI (an acronym for the states it serves: Washington [Seattle & Spokane], Wyoming, Alaska, Montana and Idaho), and sets in motion plans to advance health-related research, entrepreneurship and interdisciplinary health sciences teaching in Spokane.